Leaders at our company gathered Thursday afternoon at 123 Hale Drive for a groundbreaking ceremony on the site where we’ll eventually have a larger store than our current location at 600 N. Holmen Drive. We’re getting some new digs in Holmen! Leaders at our company gathered Thursday afternoon at 123 Hale Drive for a groundbreaking ceremony on the site where we’ll eventually have a larger store than our current location at 600 N. Holmen Drive. The 67,000-square-foot store is expected to open in October. 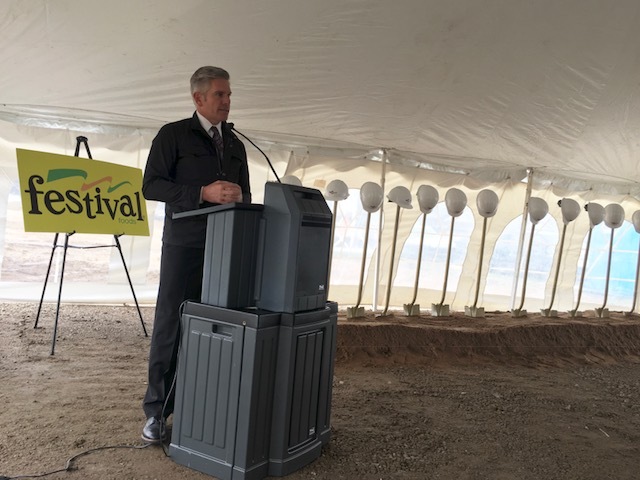 This new location will allow us to better serve our guests in the Holmen area, Festival Foods President and CEO Mark Skogen said. The layout of the 65,000-square-foot store will be similar to many of our newer locations. You’ll see all the familiar features such as the Tot Spot, a community conference room and a built-in Brat Barn that area organizations can use as a fundraiser. The replacement store also will offer shoppers an expanded selection of natural and organic foods as well as other items. This store also will have larger windows on the front and sides of the building to let in more natural light. Our company has a long history in the Holmen community and we’re excited for a new chapter with our long-time friends and guests there!